This chapter presents an application of subjective well-being measures to the analysis of a specific public policy. It explores whether and how activation of social assistance recipients through public works impacts on their subjective well-being outcomes. The program under analysis is the public works program in Serbia. This chapter provides a conceptual framework for understanding the main dimensions of subjective well-being for the unemployed poor and places the overall discussion in the context of work activation of welfare recipients. The applied qualitative analysis of the data obtained from semi-structured in-depth interviews focuses on the changes in different dimensions of subjective well-being. It takes into account the periods before and after the public work activity. Despite the low employment rate of program participants after the completion of the program, the qualitative analysis reveals significant positive impact of work engagement on subjective well-being of social assistance recipients. The evidence is strongest in relation to their positive perceptions about the level of acquired qualifications, skills, and social contacts. Arandarenko, M., & Krstić, G. (2008) Analiza uticaja politike zapošljavanja i aktivnih mera tržišta rada u Republici Srbiji 2003–2007. http://www.inkluzija.gov.rs/wp-content/uploads/2009/10/Analiza-uticaja-politike-zaposljavanja-i-APTR.pdf. Accessed 1 March 2010. Bonin, H., & Rinne, U. (2006) Beautiful Serbia, IZA Discussion paper No. 2533. http://ftp.iza.org/dp2533.pdf. Accessed 1 December 2008. 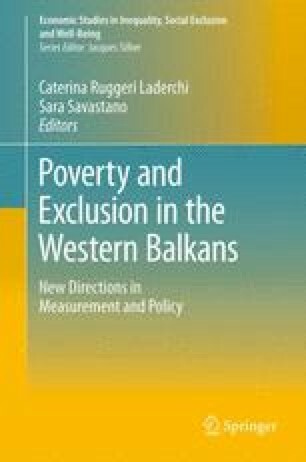 Matkovic, G (2009) Poverty in Serbia during the transition – Trends, policies, dilemmas. http://siteresources.worldbank.org/INTECAREGTOPPOVRED/Resources/GordanaMATKOVIC.pdf. Accessed 1 March 2010. Veenhoven, R. (2004) Subjective measures of well-being. WIDER Discussion Paper, 2004/07. United Nations University. http://ideas.repec.org/p/unu/wpaper/dp2004-07.html. Accessed 1 December 2008.